Using efficient and stable solid amine adsorbents to capture CO2 has been considered as an effective technology to reduce the CO2 concentration in the atmosphere. In this paper, a series of solid amine-containing fibrous adsorbent for CO2 capture were prepared by direct modification of polyacrylonitrile (PAN) fibers with amination reagents, including diethylenetriamine (DETA), triethylenetetramine (TETA), tetraethylenepentamine (TEPA) and polyethyleneimine (PEI). Abundant amine groups can be introduced on the PAN surface owing to the reactivity between cyano group and amino group. The effects of the type and structure of amination reagents on the swelling properties and CO2 adsorption capacities of the as-prepared adsorbents were investigated. The results indicated that chemical modification of PAN fibers with amine compounds could greatly increase the CO2 adsorption capacity of the aminated adsorbents. 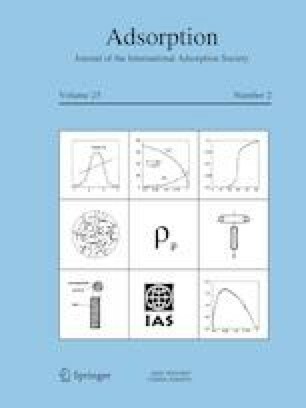 The adsorption capacities of the adsorbents were correlated well with the content of amino groups. PAN–TETA and PAN–TEPA showed higher CO2 adsorption capacities and better stability than PAN–DETA and PAN–PEI. Besides, as water molecules could take part in and facilitate the CO2 adsorption, the CO2 adsorption capacity of amine-modified fibers would be strongly dependent on the swelling property. The authors gratefully acknowledge the financial support provided by the National Natural Science Foundation of China (Grant No. 51873238), Science and Technology Project of Guangdong Province (Grant Nos. 2016A010103013, 2016B090930007, 2016A040403094).